Capelin is a fish that resemble smelt. They are known to spawn of the coast of Hokkaido on towards Canada. It is very rare to find male capelin being sold in Japan as they are used in feed production. Capelin is a good source of vitamin B12 that is used by your body to turn carbohydrates into energy and selenium. It is commonly eaten with mayonnaise. To reduce calories in your diet, eating with lemon juice instead is a good calorie reduction. 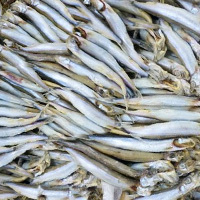 The calories in Capelin per 30g(1fish small approximate) is 53 calories. Capelin is calculated to be 177Cal per 100 grams making 80Cal equivalent to 45.2g with 4.68g of mostly protein、3.48g of fat、0.15g of carbohydrates in 30g while being rich in vitamins and minerals such as Vitamin B12 and Selenium.